The ongoing family room decorating saga continues! That was pretty much the extent of my decorating. I’ve been going nuts trying to figure out what to put in the empty space along the back wall with the windows. I can’t put any type of wall shelving because of the windows, and the space is pretty narrow, so I can’t have anything that sticks out too far. Over the course of the past month I’ve managed to acquire a few pieces of furniture. One is a sofa table I scored from Goodwill for $35. I’m thinking that maybe one of these pieces of furniture will fit along the back wall in front of the window on the right. Instead of dragging both pieces into the house to try them out, I measured them and taped the measurements off on the floor so I could get a visual of how they would fit in the space. 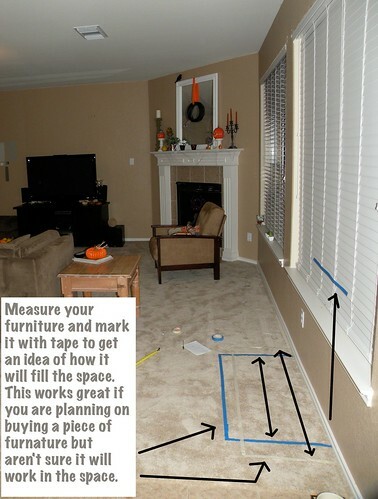 I measure and tape the floor all the time. 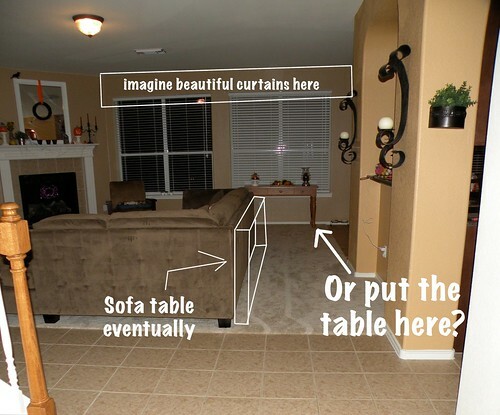 It’s a great way to get a feel for a piece of furniture, especially if you are planning on purchasing it and can’t just drag it in there to test it out. 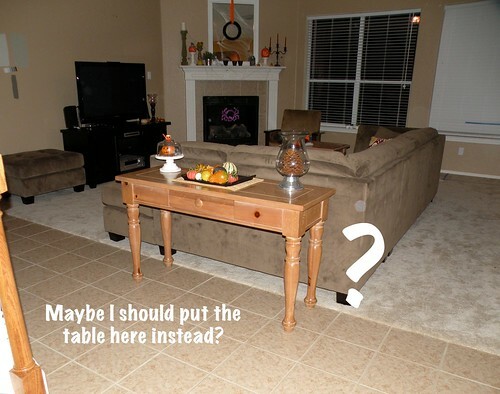 Have you ever purchased a piece of furniture assuming it would work well and fit in a space only to discover it just doesn’t work at.all.? I threw a few accessories on top of it to get a better feel and photographed it from all angles. Honestly, I don’t think it looks bad but there is just something about it that seems “off” to me. After a few minutes of trying to force myself to like the table on the side of the couch, I finally gave up and dragged the table over to my original spot I had in mind for it. At first glance, I’m really liking it, but lets see if it starts to rub me the wrong way. Another thorn in my side is the arm chair I’ve got next to the fireplace, but I’ll get to that in a minute. I let this table sit here as I mull it over, and the more it sits there the more I like it. Obviously it will look even better once it gets a fresh coat of paint and some new accessories. And maybe some baskets under it. But as for the actual placement of the table, I have to say I’m quite pleased with it. 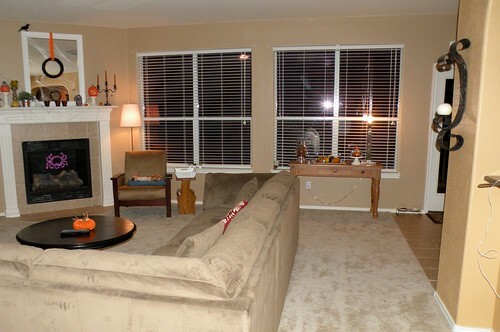 And yet another angle of the family room, just to give you a better idea. I’ve officially decided I like the placement of the table. Now I just need to give this bad boy a fresh coat of paint and some better accessorizing and I’ll be good to go! Monday I’m going to show you all my plans for this room – paint, fabric, furniture! I’m SO excited to show you what I’ve come up with, so make sure you stop by on Monday! That was fun to see the table in different locations. I didn’t like it behind the couch either. I like it under the window best. But, I wonder if you tried it in the center of the two windows. Then is would serve and a table for the chair you have there and also it is more symmetrical. Not that that matters but you could try it there just for kicks. Can’t wait to see it painted. Hm, that is a bit awkward. I, too, like it next to the window rather than behind the sofa, too. Can’t wait to see it painted, and to see your picks on Monday! I think I agree with Brooke! I think it would look great centered between the windows, and then place a HUGE oversized basket on the floor to the right of the table with throws, or something else low and short to fill the floorspace next to it. Could even be a pot with a low growing plant. Looking good! I think centered might be better too, and I like the basket idea, but perhaps under the table. And of course I’ll be back Monday. I think it could work over there by the window, but how will it look after your drapes are there? That open space won’t look so bare with the curtains hanging down. I don’t think it worked behind your couch becuase it was right in the walkway and the flooring was different so it didn’t flow as well. Good idea about the baskets underneath for large pillows or blankets. I’ll have to remember that tape trick before moving a piece 50 million times. You should take a picture of the dresser there for us to see. I am imagining something shorter. I like the sofa table and your placement of it under the window. Now I can’t wait to see what you will do with it finish wise!!?? Looking forward to Monday now!! Ha! K, after looking at your pictures over and over again to try and help out, here is my two cents. I think you are jumping the gun by forcing a table over there. It looks good, don’t get me wrong, but drapes are what is really needed first. 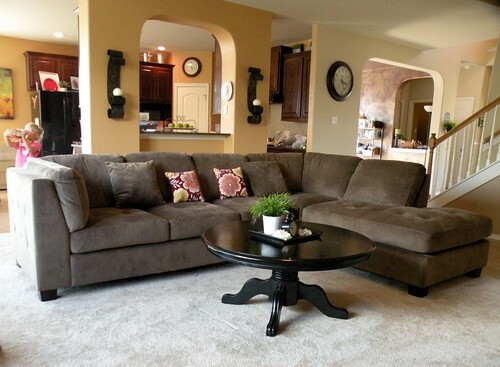 It will soften that area up so much visually, you might not feel the need to fill it with furniture. (look forward to the Monday post) I say take that table and use it for your computer. Is that a fold out table and chair I am seeing for your blogging area? 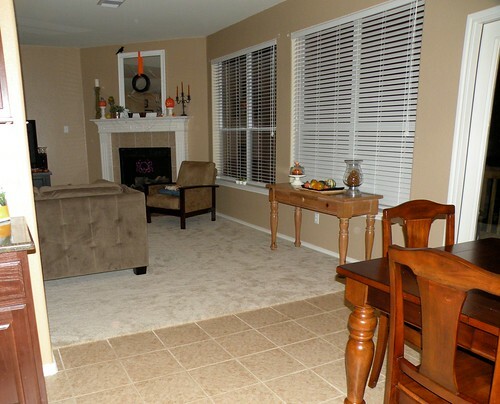 You could move the chair that is by the fireplace over to the other side of the room and put the ottoman in front of the fireplace (maybe move the tv down just a tad?) Oh and paint those walls already! LOL I just painted sherwin williams perfect gray on my daughter’s walls and I LOVE how the gray looks. Never used gray before. It is so warming and goes really nice with browns. See you Monday. 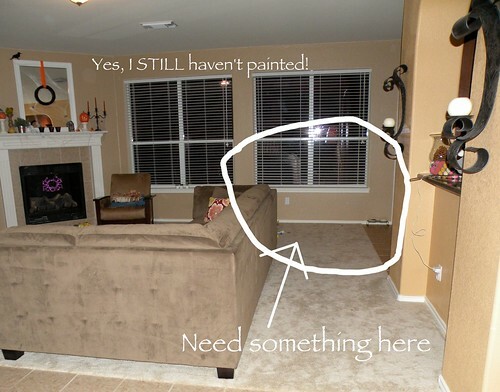 I like the way it’s painted now, but I understand if you don’t want beige beige and more beige. Believe me your living room is gorgeous!! I agree about the table being by the window and centering it. Is centering a word? hmm lol I’m looking forward to seeing what your plans are too. 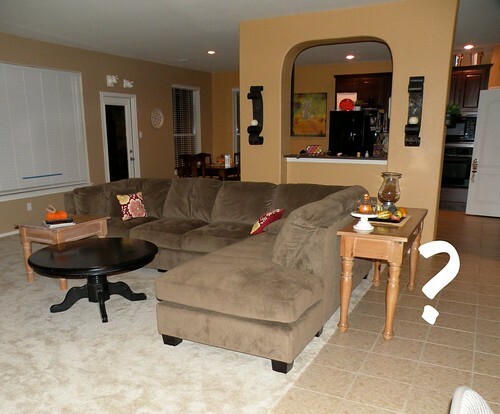 What if you tried the sofa table under the pass thru to your kitchen, between the two chunky wall sconces? Would it fit there? I enjoy your blog very much and it’s fun to see your new house taking shape. I’m so impressed that you do so much yourself! I think you need a rug 🙂 Is there enough room to put your Good Will table behind the couch where you want a sofa table? Lovin’ the moo and oink and pillows! p.s. so fun hanging out yesterday! What color are you thinking about painting it? I like the table under the windows. 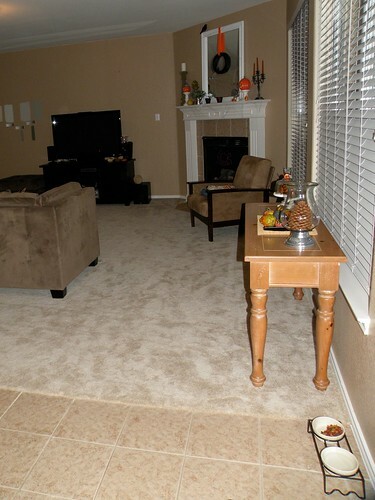 I definitely think you should bulk up the bottom half with rattan ottomans/baskets that you could slide underneath. Just make sure they’re tall enough to fill most of the space below the table. 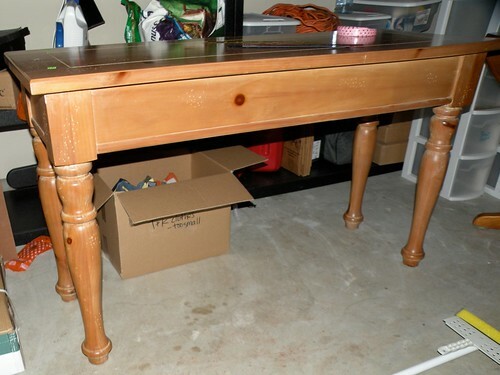 They’ll go a long way to making the table feel less leggy. Can’t wait to see your plan for the space! Especially the paint color! I like the Table by the window. 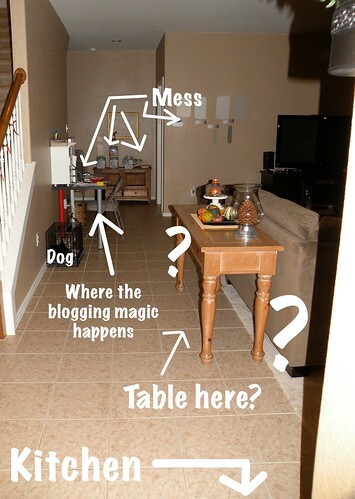 I cant wait for your next blog post — when you give that table a coat of paint — that is, if you were planning on it lol. I always LOVE what you do. Im always telling people how awesome you are, i wish i could do the things you do! Your mom must be proud!! I love the wall sconces! I decided I ALSO need wall sconces… I went on Craigslist and found the same exact ones!! !